You want the look of wood without the high price and the high maintenance. Pergo floors can be an attractive and cheaper option over hardwood. Although the durability of Pergo vs. hardwood is debatable, it is possible to scuff and scratch Pergo, so knowing how to clean them the right way will keep your floors damage-free. Because Pergo floors aren't actually wood, you don't use the same techniques as you would to clean hardwood floors. This laminate product requires different cleaning methods in order to keep it looking like new. Fortunately, if saving money is one of the reasons that led you to purchase Pergo floors, cleaning them is just as budget-friendly. For most cleaning jobs, the products you need are probably already in your home. 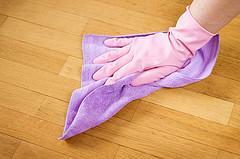 You'll have to see how dirty your floors are in order to determine which cleaning method is best. To prevent heavy-duty cleaning all the time, make an effort to do minor cleanups as needed. This may be once a week to several times a week, depending on whether you have pets or a large family parading through the house. Cleaning Pergo floors can be done wet or dry. Cleaning your Pergo floor without water is relatively simple. This will help to pick up any pet hairs and dust on a regular basis. You can either sweep with a regular brush or use a dusting mop. To vacuum your Pergo floor, use a brush attachment that won't scratch it. It's a good idea to get into the habit of dry cleaning your floors routinely - this helps prevent a buildup of dust and dirt that may then require a more intense cleaning job. About once a week or so, damp clean your Pergo floors with either water only or with a vinegar and water mixture. Mix one cup vinegar with one gallon of warm water in a bucket. Alternately, use only warm or hot water. Wet your mop in the water mixture and then wring it thoroughly. You don't want to saturate the floor; you only want it dampened. If you find any particularly wet spots or puddles afterward, soak them up with a soft cloth. Non-abrasive cleaners like ammonia may also be combined with water for cleaning up grease, juice, chocolate or wine. Acetone nail polish remover can help remove nail polish, cigarette burns, tar or markers. Gum and candle wax can be scraped off with a firm, plastic scraper. While you can easily use water and/or vinegar to clean your Pergo floors, you may want to try some of the cleaning products that the manufacturer sells. Look for them in your local home improvement stores. In many cases, these will only be necessary for hard-to-clean stains. Not only will some of these cleaning products and methods leave a film on your floor, they may also damage the surface. Taking care of Pergo floors is very similar to cleaning other types of laminate floors. Getting into a regular cleaning routine now will help keep your floors looking great for years to come.